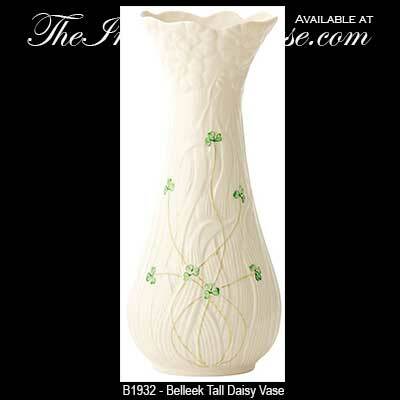 Belleek China daisy vase is enhanced with hand painted shamrocks along with a daisy motif. This Belleek vase measures 4" wide x 10 1/2" tall and features embossed daisy flowers along the rim and green shamrocks and stems on the body. The fine china Belleek daisy vase is handmade and hand painted in Belleek, Ireland and it is gift boxed with a shamrock history card, complements of The Irish Gift House. 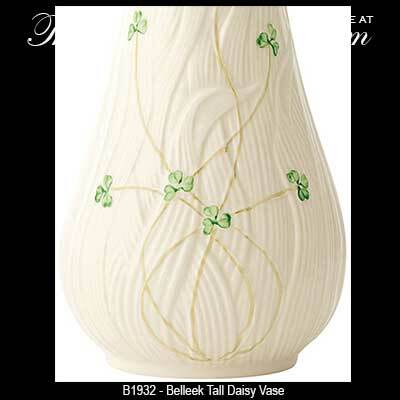 Belleek lamp and shade with its shamrocks and embossed daisy motif will enhance any room on your home. Due to the weight and size, this Irish lamp ships separately and ONLY by ground freight. Typical delivery is 5 - 7 days. Belleek China daisy spill vase features hand painted green shamrocks along with a daisy motif along the rim. Belleek box features fine Irish china that is enhanced with an embossed daisy motif along with hand painted shamrocks. 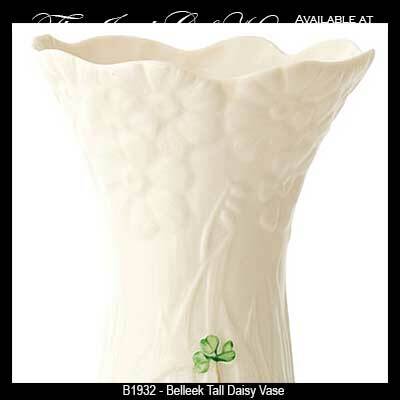 Belleek China daisy toy spill vase is enhanced with hand painted shamrocks and embossed daisies.